15/02/13 – Structural reforms offer governments a powerful tool to boost economic growth, create jobs and bring about a strong and balanced economic recovery, according to the OECD’s latest Going for Growth report. This year's report assesses and compares progress that countries have made on structural reforms since 2011 and takes a fresh look at reform priorities to revive growth sustainably and boost employment. It shows that the pace of reform has accelerated where it is most needed – in the European countries hardest hit by sovereign debt duress, including Greece, Ireland, Italy, Portugal and Spain. The report draws attention to the more moderate pace of reform in other euro area countries, notably those with current account surpluses, like Germany or the Netherlands. The highest-income OECD countries, like Norway, Switzerland and the United States, and key emerging-market economies are also shown to have made more limited progress on key reforms. 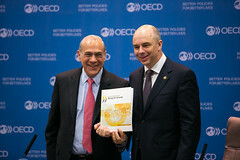 Mr. Gurría presented the report in Moscow with the Russian Federation’s finance minister Anton Siluanov, ahead of the 15-16 February meeting of G20 finance ministers. He said its key country-specific structural reform recommendations are applicable to OECD and G20 countries alike. Since Going for Growth was launched in 2005, the annual report has identified key reform priorities to boost economic activity and raise living standards in each OECD country. Since 2011, the report also addresses reform potential in Brazil, India, Indonesia, China, the Russian Federation and South Africa - the so-called BRICS - and is the basis of the OECD’s wider contribution to the G20 Framework for Strong, Sustainable and Balanced Growth. In Europe, where unemployment is still above pre-crisis levels, many countries (including Denmark, France, Italy, Portugal, Slovenia, Spain and Sweden) still need to lower barriers to job creation, hiring and mobility, while improving incentives to take up work. In Japan and Korea, raising the labour force participation of women is key, and will require better benefits systems and improved childcare policies. In lower-income OECD countries (like Chile, Mexico and Turkey) and the BRICS, reducing informality is a common challenge, so governments must improve incentives to create and take jobs in the formal sector. In the United States, unemployment has receded somewhat from its post-recession peak but the number of long-term unemployed and discouraged job seekers remain high, calling for programmes that provide training and employment services to be beefed up and streamlined. One special feature of this year’s report is to explore the side effects of pro-growth policies on other objectives, such as reducing income inequalities and preserving the environment. Fostering greater equity in access to education - a priority for quite a number of countries, in advanced and emerging economies of the G20 alike - is a good case in point. But the report also finds that shifting part of the tax burden from labour to consumption is good for growth but likely to widen income inequalities. These policy trade-offs need to be borne in mind when designing growth policy packages. Further information on Going for Growth 2013 is available at: www.oecd.org/economy/going-for-growth-2013.htm. Detailed individual country notes are available on all OECD and BRIICS countries. For further information, journalists should contact Lawrence Speer (+33 6 8014 0546, Lawrence.Speer@oecd,org) or the OECD Media Division (+33 1 4524 9700, news.contact@oecd.org). Japanese version of the press release.